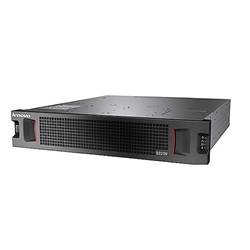 The Lenovo® Storage S2200 (as shown in the following figure) provides simplicity, speed, scalability, security, and high availability for small to large businesses. The S2200 SAN array delivers enterprise-class storage management technology in an affordable solution with a wide choice of host connectivity options, flexible drive configurations, and enhanced data management features. The S2200 offers the flexible choice of 6/12 Gb SAS, 1/10 Gb iSCSI, and 4/8 Gb Fibre Channel (FC) host connectivity protocols. The Converged Network Controller (CNC) design of the S2200 makes the selection of iSCSI or FC host connectivity as simple as attaching corresponding transceivers or Direct-Attach Copper (DAC) cables to the SFP/SFP+ ports on the RAID controller. The S2200 supports up to 96 drives with up to three external expansion enclosures. It also offers flexible drive configurations with the choice of 2.5-inch and 3.5-inch drive form factors, 10 K or 15 K rpm SAS and 7.2 K rpm NL SAS hard disk drives (HDDs) and self-encrypting drives (SEDs), and SAS solid-state drives (SSDs). The S2200 can be scaled up to 288 TB of raw storage capacity.